This past week has been a series of steps and missteps, as with any project, but the net is firmly forward. On the design side, I spent quite a bit of time this week getting to understand parameterization in Fusion 360, and started applying it to the model. I also did a lot of optimization of recurring elements in the design. So, future tweaks as I get new and better information on dimensions and details will be easier to apply. The real big win this week was that I think I've figured out how to make decent-looking illuminated keycaps! The attached photo is just a prototype using available materials. I'm temporarily out of black PLA, so I used my default gray. I didn't have the right product to finish the top, so I just used black Sugru. And I only finished this prototype with 220 grit sandpaper, nothing finer. So although it still looks a bit rough, I think it's a workable approach that will give a nice, durable finish. And it fits the cover perfectly. Design of the circuits (in Eagle, of course) has started in earnest also. I'm finding that to be a bigger learning curve than Fusion 360 for the moment, but the wall always looks high when you're standing at the base of it. Just in this week, I've made leaps in my understanding. The basic Alarm Annunciator circuit is done, but I'm still fussing with the board layout in the tight quarters, and I'm pondering the type, number and diffusion of the LEDs to get the right look. 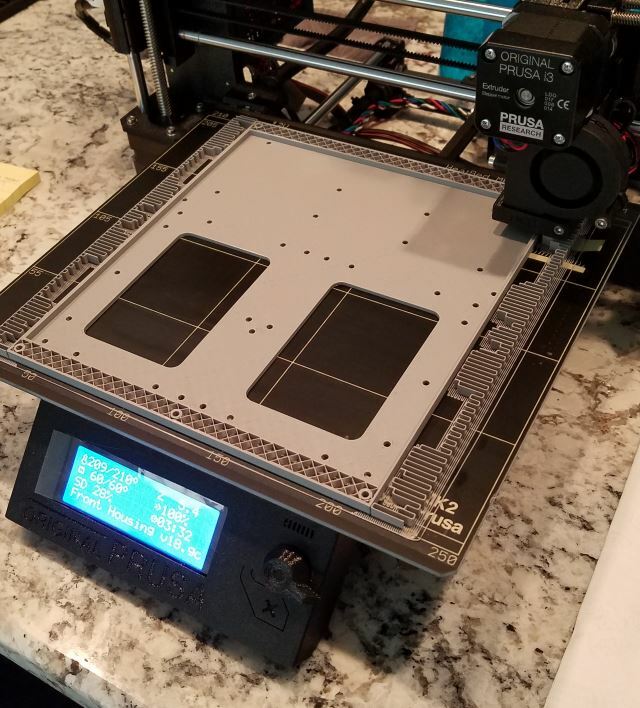 As I write this, the first try of the front housing is being printed (about an 8-hour print job). While there's a lot of finish tweaks yet to do on every part (fillets, chamfers, etc. ), completing the front housing is a big milestone. I could stop there, actually, but I'm going to go on and replicate all of the parts behind it: main housing, rear cover, and the gaskets. These will also serve to house my electronics. I might need a bigger printer. Darn.